Since the time Google’s first panda update is announced people are becoming alert and don’t want to get victimized by it. And why say victimized say caught by panda as you will only be penalized if following the wrong practices to attain a better ranking even with a low quality content on your website. However sometimes some innocent people also get caught by it even if they are not doing it intentionally and are simply unaware with the facts. Here we have a few important things that you must keep in mind in order to survive the panda update. First thing that you need to do is to identify the content that is more likely to get a hit by panda update. For this you can take help from your current analytics tool in order to build a custom report showing all the pages that have very a small amount of visits say 15 or even less than that. Now when you have the data to let you know which content is not adding any value to your website and might indicate a poor quality content. Now you need to go through these pages and make them more valuable by adding informative and immaculate content if required. It will help you attract organic visitors and social interactions. However if you think it is not required you can go ahead and redirect them to a better page on a related subject. It’s good that you are not using ads on your site however if you are using ads on your site and your site pattern has a high fraction of ads above the fold try to move them to a place that describes its worth more intelligently and utilize the ad more wisely. People visit your site to get some information that’s the content on your page hence make sure it’s easily accessible. If your website is relatively larger it might happen sometimes that it cause some issues leading to ruining the quality of your website. Things like internal duplication of page caused by parameters, empty pages or broken links impacts very badly on your reputation and even gets a big hit by the Google’s panda update. That is why you are asked to do regular clean up of your website. You can use 301 redirect and the canonical tag to heal your website against these issues. A technical SEO specialist can help you do these things in a much better way. One sentence for hundred is create quality content. The content that you are publishing must add value to your visitors. Seo is not confined to hitting a certain keyword density it is rather a lot more these days. You have some metrics that you must consider while weighing up your content such as number of page views, number of inbound links, number of organic visits and number of social interactions. If these metrics reflect that people are finding your content relevant and useful, chances are it might save you from panda update. Earlier what use to happen that people use to take short cuts to attain rankings which lead to quality of the Google search experience to be compromised. Chances were sometimes low quality sites get ranked above the ones who are actually following the right process and doing the work, not just that which are worth reading. But now with the new panda update it would not be possible for low quality sites to do any short cut and get a better ranking. The same is suggested to you never put your business at risk by executing any kind of wrong SEO practice instead simply concentrate on generating useful and immaculate content that you visitor will find interesting. No matter what Google Panda update has in store for you, if you are following the correct process you will never be caught negatively by it and will stay clear of any negative impact going forward. Hence avoid practicing any wrong SEO use or stop misusing the SEO practices to get a better ranking in shorter time, instead follow the process. It will never let you look down and will be ever paying. 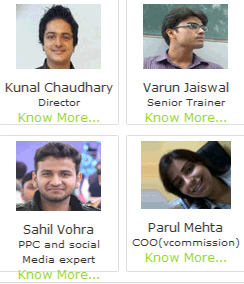 At DSIM we have internet marketing industry leaders who share their rich experience & knowledge with our trainees.